The Black Knights were leading at the half, but an 11-4 run by American to close out the third quarter gave the Eagles enough breathing room for a 75-62 win. WEST POINT – The Black Knights were leading at the half, but an 11-4 run by American to close out the third quarter gave the Eagles enough breathing room for a 75-62 win at Christl Arena on Saturday afternoon in a Patriot League women’s basketball matchup. 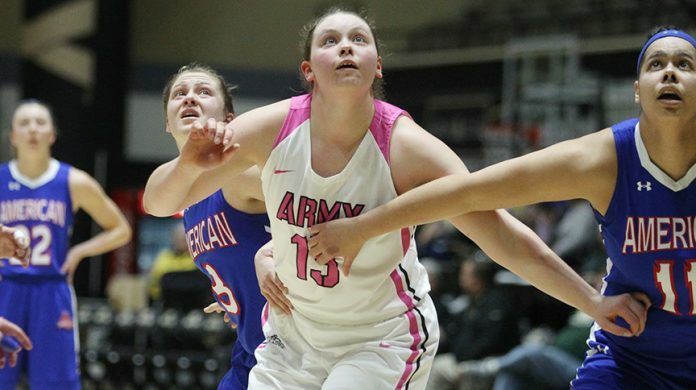 Army had two players in double figures, including Madison Hovren, who finished with 21 points and 12 rebounds. She was 9-of-10 from the charity stripe as well. Kate Murray chipped in with 14 points and six rebounds as she was 6-of-12 from the floor. Alisa Fallon added nine points and four rebounds. Cecily Carl played a monster game with 28 points and 10 rebounds. She was 11-of-14 from the floor and 4-of-7 from three-point land in the win. Kaitlyn Marenyi recorded 14 points off the bench, while Kaitlyn Lewis added 13 points for the Eagles. American shot 45-percent from the field and was 13-of-28 (.464) from three. The Eagles took care of the ball, as they only turned the ball over eight times and had 22 assists as a team. Army started out well with a 6-0 run in the first two minutes, but 3-pointers by Carl and Jade Edwards tied the game up at 8-8 with 6:23 on the clock. The Eagles were able to take a 19-15 lead with 3:05 left with an Elina Koskimies three, which answered a big 3-pointer by Fallon. Army was able to tie the game at the end of the first with the final four points and it was 19-all heading into the second. Army hung in with one the top teams in the conference throughout the second quarter and was matching the Eagles shot-for-shot. Morgann Yancey hit a big three with 4:34 left in the frame to tie the game at 24-24. After Carl scored another 3-pointer, Hovren hit a layup and then Murray gave Army a 29-27 lead by draining a three of her own with 3:15 on the clock. Carl answered again with a layup and then Army went on a 5-0 run with Murray hitting another shot from distance. The Black Knights took the 36-32 lead at the break with Fallon scoring off glass with eight seconds left in the quarter. Army held onto the lead for most of the third quarter, but a late 11-4 run gave American a 51-48 lead at the end of three frames. Indeya Sanders dropped a big three and Lewis had four points during the run. Hovren led the way for Army in the quarter with eight points and six of those came from the free throw line. The Black Knights continued to fight and claw to get back in the game and had it down to three points at 56-53 after a layup from Hovren, but Marenyi answered with a three to make it 59-53 with 6:34 on the clock. The Eagles then went on a 9-0 run with three-point plays from Marenyi, Lewis and Koskimies, giving American a 68-55 advantage with 4:16 remaining. Army couldn’t answer the run and the Eagles left West Point with a 75-62 victory over the Black Knights.